Holy hell this book was good! I’ve been a fan of Mark Lawrence ever since a blogger friend of mine poked me again and again and again to pick up Prince of Thorns. And I’m glad they were so insistent. There’s something of a philosopher poet in the way Mark writes, turning a simple turn of phrase into a beautiful work of art. 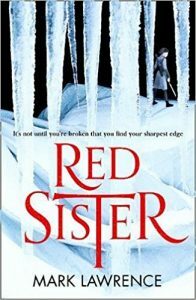 And in Red Sister he certainly doesn’t relent. The book is littered with gorgeous lines and thoughtful observations, all wrapped up in a relatable hero, and blood spattered ultraviolence. Our hero of the piece is Nona Grey, a young girl about to be hanged for defending her friend. Only she is whisked away moments before death by a nun, and then inducted into the nunnery. But these aren’t normal nuns, they’re murder nuns… at least some of them are. The nuns are trained in various schools including combat, magic, mysticism, and deception. Because the best way to make nuns cool is to make them ninjas! There is a subtle depth to the world building that is offered only in edible morsels. The people of the world have four distinct blood lines which dictate the powers they can develop. The world is fed by a dying sun, and most of the people live in a small band of habitable land around the world, surrounded by glaciers. Stuff like this makes the world feel both alive, and brutal, and gives an underlying threat to everything that is happening. The world is dying, and you KNOW that’s going to factor in somewhere along the story. I rocketed through the book at something approaching record speed for me. It’s paced so well that there’s never a point that feels good to stop, so it’s entirely possible (and at other times necessary) to plough on and read “just one more chapter”. Some of the cliffhangers are evil! EVIL! 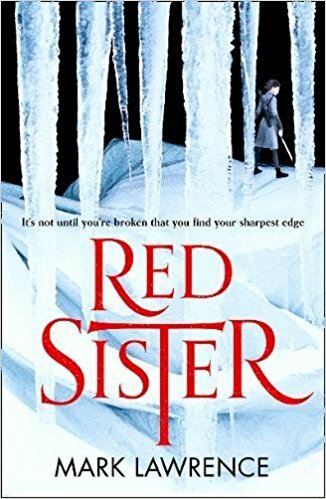 I tend to reserve my 5 stars for something that is truly special, and I’ll happily give Red Sister all 5 of those stars. It mixes action and drama perfectly, and gives us characters we can root for, twists that wrench the heart, and a world that I can’t wait to hear more from. And it’s all wrapped up in Mark Lawrence’s beautiful prose.